Full Fitness Gym, Visiting on the 15th February !!!!! We’re now 5% Nutritions official stockist for Norfolk and one of the larger leading brands to stock the products in East Anglia. 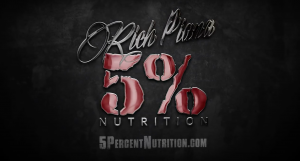 5 Percent Nutrition in recognition of this is sending the new face of 5% Martyn Ford himself into Full Fitness Gym to visit our members talk to us and introduce the new products with tasting sessions and giveaways. Martyn Ford will be having a small training session in Full Fitness Gym Watton and showing us what he can lift and why he has made a name for himself. We are allowing non members into Full Fitness Gym on the 15th of Feb. Day pass rates will be set and can be paid for on the day as its a special occasion but feel free to come and visit us and look around the gym. Watton Norfolk hasn’t seen anything like it and we really want to show larger chain gyms how it can be done. In his younger years, Martyn had a great future ahead of him in cricket – he was living his dream. But, due to some unfortunate circumstances, this dream became “a mission impossible”. As a result, he had to search for other ways of fulfilling his life. Some would’ve given up in Martyn’s situation, and would’ve completely lost their sense of direction in life. However, Martyn didn’t give up because of the adversity; instead, he came out stronger and learned something from it. He channeled all the negative energy into fitness, unknowingly building a successful future for himself. Thanks to this kind of mentality, Martyn now lives another story; completely different than he had planned. But, he’s happy with his progress, and he says he; “couldn’t ask for anything more”. Whenever you’re faced with a difficult challenge in your life, remember Martyn’s story. Because that difficulty may just be another way of reaching greatness in the future.